Now you can own your very own Rubes® Tee-shirt! With over 12,000 cartoons from over three decades of Rubes® there are lots of cartoons to select from! That’s right, you can choose from any* Rubes® cartoon ever created! Leigh has partnered up with ALL U, Inc. , a family owned and operated company with over 30 years of experience in the screen printing and embroidery business to bring you your favorite Rubes® cartoon on your very own Tee-shirt! These high- quality tee-shirts are available in men’s, women’s and children’s sizes. Click on the link below the image to see our t-shirt selection. Don’t see your favorite cartoon on any of those pages? No problem! Just send us an email describing which cartoon you would like, (including the original published date if possible), on your shirt, and what size and quantity you would like, and we will email back you a link to enable you pay on line. Yes you can be the first kid on the block -First kid in the world! 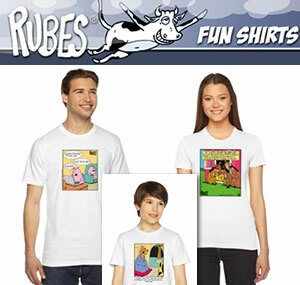 ... to own your favorite Rubes® cartoon tee! * Unless of course it infringes on copyrighted material. We certainly wouldn't want any trouble!